"Gion Sairei Shinkôki" was staged for the first time in Edo in the 5th lunar month of 1758, at the Moritaza [casting]. "Gion Sairei Shinkôki" was orignially a 5-act drama. The "Kinkakuji" act, the only one still performed nowadays, is the 4th act of the original puppet theater drama. This scene is no more part of the current Kabuki repertoire. In the garden of the Palace of the Shôgun, Ashikaga Yoshiteru, Matsunaga Daizen, the Shôgun's chief retainer, makes advances to Princess Yuki, daughter of Sesson, a noted painter, but meets her flat refusal. As soon as Daizen goes away, having been called by the Shôgun, Princess Yuki is met by a young painter, Kanônosuke Naonobu, with whom she is in love. She tells him that her father Sesson was murdered and asks him to help her avenge her father. After they have gone inside the Ashikaga palace, Hanatachibana, a courtesan with whom the Shôgun is in love, comes to the garden and is approached by Miyoshi Shumenosuke Masayasu, the Shôgun's retainer, who also loves her. Their meeting is detected by the Shôgun. Matsunaga Daizen demands that Masayasu commit suicide in expiation but the Shôgun's mother, Keijuin, interferes and accuses Daizen of his improper love for Princess Yuki. At Keijuin's suggestion Princess Yuki sets out on a trip with Naonobu. After dark Daizen hands a rifle to Hanatachibana in the garden of the Ashikaga palace, asking her to shoot Masayasu if he crosses the garden to visit her. She fires at what she believes to be Masayasu but the victim proves to be the Shôgun himself. Realizing that she was tricked by Daizen into assassination, she takes her own life with the Shôgun's sword. 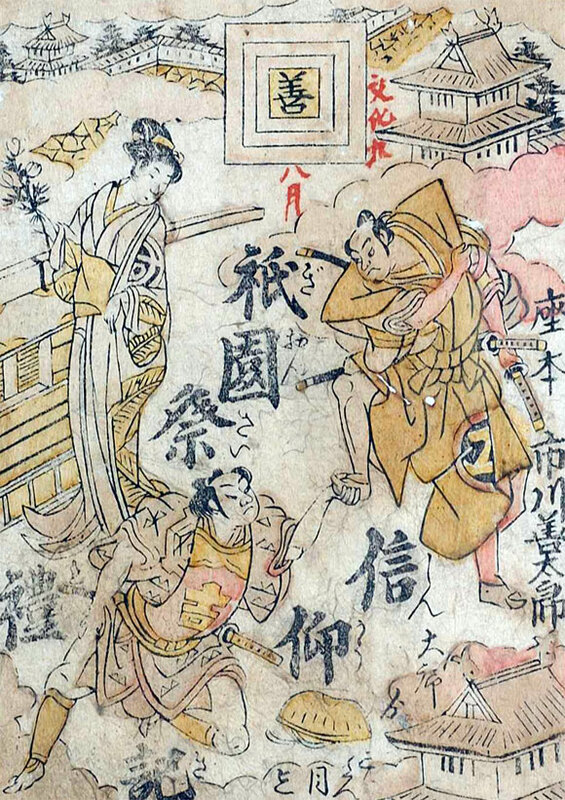 The menoto Jijû, in charge of the Shôgun's infant heir, Teruwaka, successfully smuggles the young boy out of the palace but Masayasu is killed by Daizen with a rifle. Daizen seizes Keijuin as a hostage in order to usurp power. To help his master, the druggist Konishi Zesai, to pay his debt, his servant Shinsaku sells a fake carrot to a farmer at an exorbitant price on the street. Later the farmer, who had found that he was cheated by Shinsaku, comes back with a few other farmers and ties him to a pine tree to have him burned to death. After they have gone to get the local governor's permission for the execution, Teruwaka, son of late Shôgun Ashikaga Yoshiteru, comes with his nurse Jijû to take a rest on the grass. Three hoodlums, Dosu-no-Kizô, Tsubute-no-San and Kanta, come to capture them. Kizô, finding Shinsaku in a helpless condition, says to him that he is trying to make money by arresting the boy and his nurse. Shinsaku says that he will help him if he is freed. As soon as Kizô unties him Shinsaku tells Kizô that he has his money concealed among branches near the top of the pine tree. When Kizô climbs the tree, Shinsaku hits him hard with a pole and causes him to fall to the ground. He then ties Kizô to the pine tree and covers his face with a mask to have him burned to death in Shinsaku's place. Meanwhile, Jijû is killed in her fighting with the hoodlums. To avoid children trying to bully him, Teruwaka takes shelter in the house of Zesai at Tengachaya near Ôsaka. Zesai's wife Osaji kindly takes care of him though she does not know the boy's identity but Zesai's servant Shinsaku, who knows it reports to the local governor's office that Teruwaka is in Zesai's house. Soon Sogô Gumpei, in reality Satô Masakiyo, comes from the local governor's office and takes the boy away. Zesai comes back with the village shôya Mochibei and several villagers carrying the body of Jijû. Jijû miraculously revives when Zesai opens her mouth and puts medicine into it. She says that Teruwaka is in fact her son and that he was adopted by Shôgun Yoshiteru when his own son, who was born about the same time, died soon after his birth. Jijû dies again after saying that she is sorry not to be able to see her son. Osaji then commits suicide with a dagger, holding herself responsible for her failure to prevent the arrest of Teruwaka. Konoshita Tôkichi, a military leader, who used to be Zesai's servant when Zesai was a warrior, comes to see Zesai and tells him that he will recommend Zesai to Oda Harunaga as his military adviser. Instead of accepting Tôkichi's offer, Zesai commits seppuku, saying that he cannot serve Harunaga who is planning to kill his former master, Matsunaga Daizen. He also says that he was formerly a Chinese general and came to Japan after China was defeated in a Sino-Korean war. Tôkichi makes his men call back Teruwaka and tells him that he will adopt him as his son. He also appoints Shinsaku as Teruwaka's guardian-friend named Sorori Shinsaku. --> A dedicated summary: "Kinkakuji"
Matsunaga Daizen, who has assassinated the Shôgun Ashikaga Yoshiteru, confines the Shôgun's mother Keijuin to the top floor of the three-storied Kinkakuji in Kyôto. Daizen wants to have an ink picture drawn on a ceiling panel of her room either by Princess Yuki, the granddaughter of Sesshû, a famous artist, or her husband, Kanônosuke Naonobu. Konoshita Tôkichi visits Daizen at the pavilion, ostensibly wishing to serve him. Daizen challenges Tôkichi to a game of go and is defeated. Chagrined, he throws the wooden container of go stones into a well in the garden and tells Tôkichi to recover it without wetting his hands. Tôkichi fills the well with the water led from a waterfall with a bamboo pole and recovers the container with ease. Daizen takes Princess Yuki to the garden and demands that she draws the picture of a dragon. Princess Yuki refuses on the ground that she has no model to copy. As Daizen draws his sword in front of the waterfall, the reflection of a dragon appears on the face of the waterfall, a phenomenon peculiar to the sword named Kurikaramaru Princess Yuki's father Sesson used to have. No doubt it was Daizen who killed her father and took the sword from him. Princess Yuki attacks Daizen with the sword but he makes his men tie her to a cherry tree and take her husband to a place of execution. A sorrow-stricken Princess Yuki gathers petals of cherry blossoms with her feet and draws a picture of a rat with them. The picture takes life  and the "rat" bites through the rope tying her to set her free. Princess Yuki tries to run away to rescue her husband but is attacked by Kitôta, Daizen's brother, with the sword Kurikaramaru. He is, however, killed with a dagger thrown at him by Tôkichi. Tôkichi recovers Kurikaramaru for Princess Yuki. Tôkichi then climbs to the top floor of the pavilion to rescue Keijuin. Daizen, who has been observing Tôkichi's action in a place of safety, comes out to tell Tôkichi that he is ready to meet him in a crucial battle at his castle in Shigisan. the title "The Gion Festival Chronicle of Faith" comes from the 1st volume of "Kabuki Plays On Stage". Princess Yuki's father Sesson was gifted with a hereditary ability to draw an animal so realistically that it became alive.